HELP PLEASE I THINK MY BETTA IS SICK!!! they wont let me get anything to see if i can get him cured!! i mean if he dies so dose the last memories of my mother i got him at walmart the day she went into the hospital and he was here when she died an he is all the memories i have left of her and if he vanishes so does my mom!!!!! How often do you change the water? Once a week or once every two weeks is a must, about one third of it. Sometimes fish get better just by some water change. Invest in a PH kit to test the water maybe you have to adjust it accordingly. Have you got your Molly in the same tank still? Maybe you introduced the sickness?? If this all doesn't help you have to go and get some medicine from the pet store, they are not that expensive. Just describe the symptoms to the store so they give you the right stuff. Sounds like a fungus. they have dips for most things. You treat a bowl of water and put the fish in it for whoever long it says then put him back for a week or however long. but tonight i am going to take all of the fish out and scrub the tank from top to bottom about 4 or 5 times to see if i can get rid of this nasty fungus thing ( hopefully its not "ick" ) and yes i said all of the fish, i have recently aquired a kissing gurami, 3 tetra, 1 chinese alge eater, and 3 more mollies, i hade taken my betta out of the tank and put him in a bowl like tank with a bubblator and a heater but the sickness just overwhelmed him i guess , thats ok though i can replace him with another one but it will never be the same!!!! Re: HELP PLEASE I THINK MY BETTA IS SICK!!! Really sorry about your beta! I can tell you that your fish had a fungus called ICK. If this ever happens again, I'm sure a local pet store has treatment for it. Ich (or "ick" as some people call it, it's not named that because it's "icky", it's part of the name Ichthyophthirius multifiliis) looks like little sprinkles of salt or sugar all over a fish. It can be almost impossible to see on some fish. Ich is also not a fungus, it is a parasite. This is Ich. It does not look like a film around the mouth. Those tiny little white spots are the parasites. It was probably Columnaris. Did it look like this? 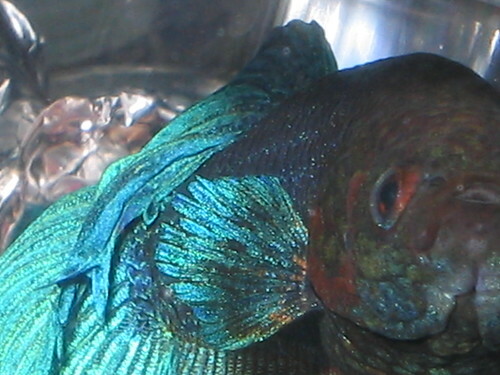 Bettas get this disease more often than almost any other fish. It is caused by stress, probably because you had it in a community tank, which Betta should not be housed in. They should be solitary. There are cases where people successfully keep them in community tanks, but it's just not a good idea. Your other fish probably won't get it, but you should treat your tank thoroughly all the same, with any infectious disease. Maracyn will clear up any bad stuff left over after you clean your tank. It is sold in almost every pet store that has fish stuff. Treat your tank with it as soon as you can. Boiling water works best for sterilizing the tank when cleaning/scrubbing. You should also add aquarium salt (NOT table salt) and change the water every 5-7 days or so for the next month. That will most likely keep any bacteria away.